Ten days ago, I asked you to tell me about your impressions of different colors. 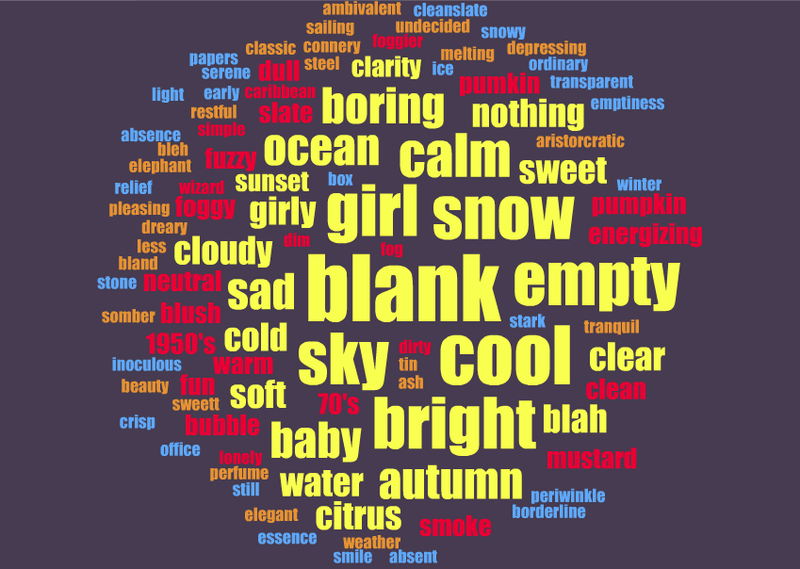 By responding to a quick survey, you described colors using words other than colors. 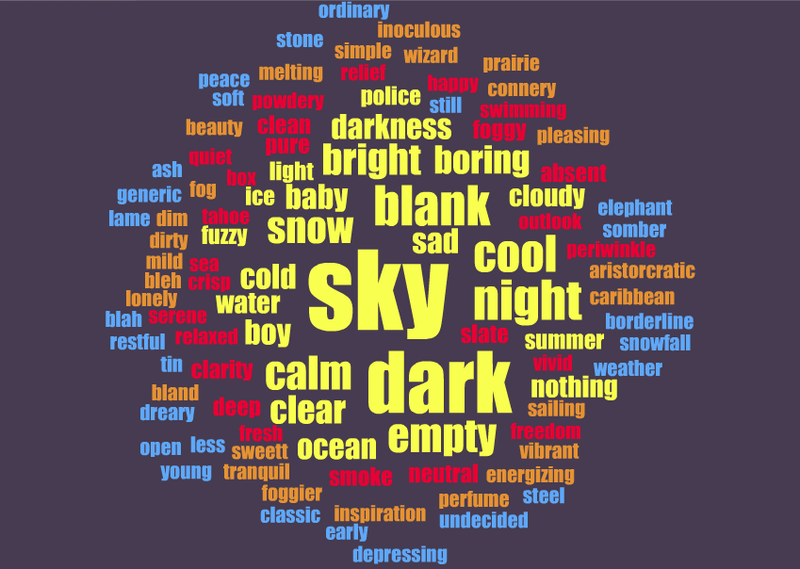 For example: descriptions such as sad, happy, sea, forest, or sky. 58 of you responded to that survey. I wasn't looking for an academic exercise, so I didn't need a large N. I'm very happy to have almost 60 people respond to the survey. Thanks! The survey included fifteen colors. I chose these colors to approximate the colors used from MacOS X Yosemite, Windows 8, and GNOME 3.14, although I intentionally added some randomness and similar colors to provide a blind. My goal was to see what emotions or thoughts came to mind based on the colors used in each operating system. What did these colors mean to you? First, let me briefly explain the analytical process. My survey asked you to "Please use a single word to describe each color." Not everyone followed that instruction; some of you entered phrases or lists of individual words for each color. Thanks, but that does make the analysis more difficult. Fortunately, in these cases, the first word in the phrase or list was representative of the response. So in analyzing the data, I only used the first word provided. Mac OS X colors provide affiliations with open, soft, and calm adjectives. Windows 8 colors compare to dark but calm descriptors. GNOME 3.14 colors correlate to open, calm, and moody attributes. As I mentioned in my previous post, colors have an important role in good design. Designers must remain sensitive to how different people perceive colors, while honoring typical color conventions. In user interface design, colors also affect the mood of an application. As seen in this comparison, users perceived the darker colors used in Windows and GNOME as moody, while the lighter colors used in MacOS X suggest an airy, friendly interface. This is not to say that colors dictate or predict the usability or user friendliness of a user interface. However, we do know that colors do play a role in how users perceive the usability of a system. As uncovered in a 2003 study, users perceive aesthetically pleasing interfaces to be easier to use. In the study, the same website rendered with an atypical contrasting color scheme fared poorer usability than the same website with a pleasing, harmonizing color scheme. This may be why users at large perceive the GNOME desktop to have poor usability, despite usability testing that demonstrates GNOME actually has pretty good usability. The dark, moody colors used in GNOME provoke feelings of tension and insecurity. Bang(1991) included color in her analysis of how people perceive images, mentioning that white or light colors feel "safer" than darker colors, because we can see well in the day but not at night. This is especially true of background colors. Of all the "dark" colors, the top associations were forest, brick, deep, and night. Also, the top associations with "black" were dark, night, darkness, and deep. Open source software projects can learn from these color associations. GNOME currently uses a dark color scheme. These colors correlate to open, calm, and moody attributes. Meanwhile, the lighter colors used throughout MacOS X provide affiliations with open, soft, and calm adjectives. 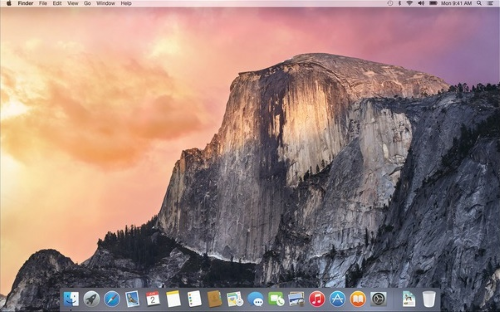 It is not surprising that users typically view MacOS X as having stronger usability. Certainly, Apple has put a lot of effort into usability testing in MacOS X, but I believe their choice of light colors was a conscious one. Even people who do not use MacOS X as their primary desktop describe MacOS X as easy to use. I recommend that GNOME adopt lighter colors in future releases. Avoid dark colors, especially in backgrounds or the desktop wallpaper. Embrace light, airy colors in the interface instead of somber, melancholy color tones. Examine the GNOME 3.14 screenshots at gnome.org. I am using the new GNOME 3.14 release, from Fedora 21 beta. I like the light background image; this is a blue that suggests sky, summer, and clear (from the color survey results). The light grey application backgrounds are also good, but the dark grey application backgrounds are not. GNOME should eliminate the black background in the top bar, in favor of a black-on-white theme. Similarly, change the black background in the Favorites launcher (at left) to a lighter grey or white background. 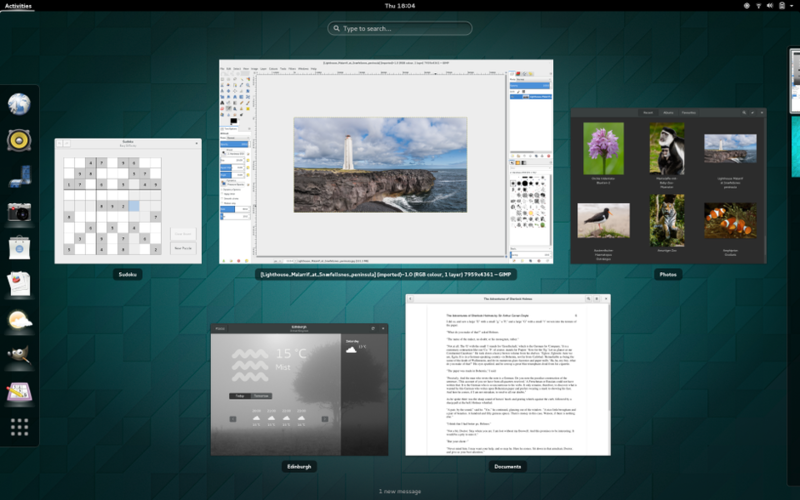 By adjusting the color theme, GNOME can influence how users perceive the usability of GNOME. Without major changes to the interface or design, GNOME would sharply improve its reception, and attract new users while encompassing the needs of current users. We all know that colors have an important role in good design. Designers must remain sensitive to how different people perceive colors, while honoring typical color conventions: green means Go, red means Stop, etc. Additionally, users will associate user interface controls that use the same or similar colors to mean the same thing. In user interface design, particularly with open source software and usability, colors also affect the mood of an application. Darker colors may be perceived to be moody, while lighter colors may suggest an airy, friendly interface. It's no surprise that both iOS and Android have shifted to using bright colors in their icons and interfaces. Colors must certainly harmonize for this to work, however. As uncovered in a 2003 study, users perceive aesthetically pleasing interfaces to be easier to use. In the study, the same website rendered with a different, contrasting color scheme fared poorer usability than the same website with a pleasing color scheme. Similarly, users learn best when applications use color in a standard way, such as links in a web page. Recently, I began to consider the perceived (not actual) usability of open source software programs based simply on their choice of color. In particular, GNOME uses a high-contrast white-on-black top bar. The new GNOME 3.14 uses dark windows for some applications (such as Photos and Weather) which is different from the light colors in most other GNOME programs (such as Nautilus file manager). Could these colors affect how GNOME is perceived by new users? Note that MacOS X uses a lighter color theme, including a "greyed out" top menu bar and Dock. 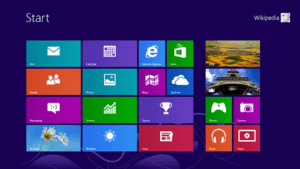 Windows 8 uses a dark blue background and darker primary colors for application tiles. GNOME 3.14 uses a muted color scheme which becomes especially pronounced when Activities View is active, as shown above. What do these colors mean to you? Do you perceive colors to affect usability? Help me to talk about how colors affect usability. I have set up a simple online survey that takes only a few minutes. In the survey, you will view 15 color samples. 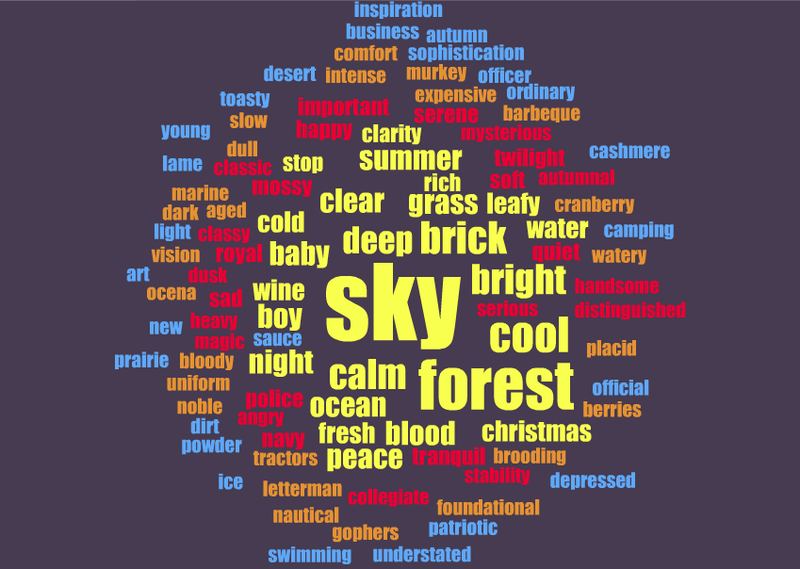 Describe each color using words other than colors. For example, you might describe the color using emotions (sad, happy) or environmental (sea, forest, sky) or other adjectives (confused, fuzzy). This is not an academic exercise, although I believe it will be useful in discussing how color choice affects open source software and usability. I'll post a brief analysis in a few weeks. I contribute to lots of free software projects, although not as much as I used to. These days, I am an advocate for usability in free software, and I am probably best known for FreeDOS, a free version of DOS. I created FreeDOS in 1994 while I was an undergraduate physics student. I am also working with GNOME to improve usability for everyday people. My M.S. capstone was the Usability of Open Source Software, in which I analyzed and discussed the usability of GNOME. The GNOME UX Design Team is a group of individuals work on the design of the GNOME user experience and developer experiences. The primary areas of work are core OS design, core application design, and the visual theme and icons. 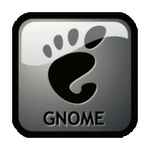 GNOME Design is a small, friendly group, and we have strong links with designers across Free Software. We are always looking for new contributors, and everyone is welcome to contribute! This is disturbing because there is already a system out there called GNOME, a free-software desktop that acts as a platform for many popular free programs. I don't know of any way to describe this other than Groupon is trying to steal the name from the GNOME Desktop. That's not right. In the U.S. legal system, trademark owners need to fight to keep their marks when others use them inappropriately. And GNOME is planning to fight this, and they have started a fundraiser on PayPal to help pay for legal costs. Please help. "Technology outside the enterprise is strikingly different because people want to use it. They aren’t trained to use it. No one spends a dime on change management. People take one look at the stuff, understand how it is relevant to their world, buy it and never look back (at least until something better comes along). The contrast between these tools and the typical enterprise system couldn’t be starker." Hambrose makes the point that to design good software for the enterprise, we need to shift "enterprise" development to think more like "commodity" development. He says designs must be "human-centered (not process-centered)." And in doing so, Hambrose is essentially extolling the importance of good usability, and strong user experience. Agile or rapid methods might be great for fast, iterative software development, but invite a designer into the exercise and you’ll learn how the design process allows for much more effective exploration and discovery. This isn’t the “design thinking” fad. This is “design doing” — technologists, business analysts, designers, researchers, executives and rank-and-file staffers defining possibilities together. They’re focused equally on the people that we need to perform, the technology we can deliver, and the business that must be served. Right there, Hambrose discusses a user-focused approaching, designing the system for what users need to do, rather than what you want them to do, or how you want them to do it. By extension, Hambrose advocates designing every in-house corporate IT system as though it were a commodity: do people want to use your product? Can they use your product to do the things that they need to do? Without using the word, Hambrose argues that all enterprise IT should have good usability, that they must focus on the user needs first. Whether you are a designer in industry or for an open source software project, the essential needs are the same: real people need to use your software to accomplish real tasks.